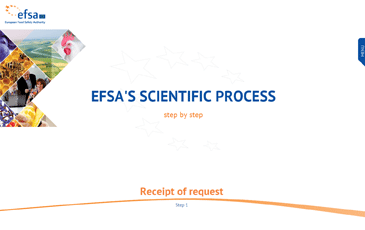 The workflow for EFSA’s scientific outputs runs from the moment EFSA receives a request for scientific advice or initiates its own activity to the moment it publishes its findings. EFSA receives requests for scientific advice mainly from the European Commission, but also from the European Parliament or Member States. The request outlines what is being asked of EFSA: the issue, the terms of reference, the timeframe and so on. Upon receipt of a request, EFSA considers its contents, discusses it with the Commission and addresses any issues that need clarifying, such as the feasibility of the deadline. Following these discussions, EFSA and the Commission agree on a mandate, which includes the final terms of reference and a mutually agreed deadline. For market applications, EFSA validates/checks the completeness of the application and may request more scientific information from the applicant. The mandate is then assigned to one of EFSA’s Scientific Panels or its Scientific Committee and made available in the Register of Questions. EFSA usually sets up a Working Group of experts to carry out the risk assessment. The working group – typically comprising members of the Panel plus additional scientists from specialist fields – assesses the scientific information available, which may include data supplied by Member States, research institutes or companies. If there is a need for further data it may draw on EFSA’s data collection networks or launch an open call for data on the EFSA website. For company applications EFSA may request more data directly from the applicant - in which case the clock is stopped on the regulatory timetable until this is supplied. The working group develops a draft and submits it to the Panel for discussion. We often hold public consultations on draft outputs and then consider the comments in the revised document. The assessment is adopted by a majority of Panel members – with any minority opinion recorded – at a plenary meeting of the relevant Panel. If the Panel does not adopt, the document is sent back to the working group for further examination and to prepare a revised draft for adoption at a following plenary meeting. The output – which is usually a Scientific Opinion, but may be a Statement, Guidance Document or another type of output – is then published on the EFSA website in the EFSA Journal, our open-access, online scientific journal.